What is wrong with these people? The above comments went public on Sunday. Saturday saw two of the most stirring victories of the decade. Greater Western Sydney were up against one of the toughest tasks in footy, facing an undefeated Geelong at GMHBA Stadium as heavy underdogs. They then lost Callan Ward to an ACL in the opening minutes. With their shattered captain openly crying on the bench, the Giants were the best part of four goals down for long stages of the first two and a half quarters before prevailing in an epic and memorable arm-wrestle. For GWS, it was their first ever win at the stadium. It was a victory of steel and emotion, the kind of win upon which a premiership could very well be built. In Adelaide against Port, Richmond were missing Dustin Martin, Alex Rance, Jack Riewoldt, Trent Cotchin, Jayden Short and Bachar Houli. That’s the Tigers’ prime midfielders, first-choice running half-backs, plus their key position superstars at either end of the ground. Whichever way you cut it, they were decimated. Richmond went in with five players on ten games or fewer, and on average player-for-player were 29 games and over a year younger than their Power counterparts. 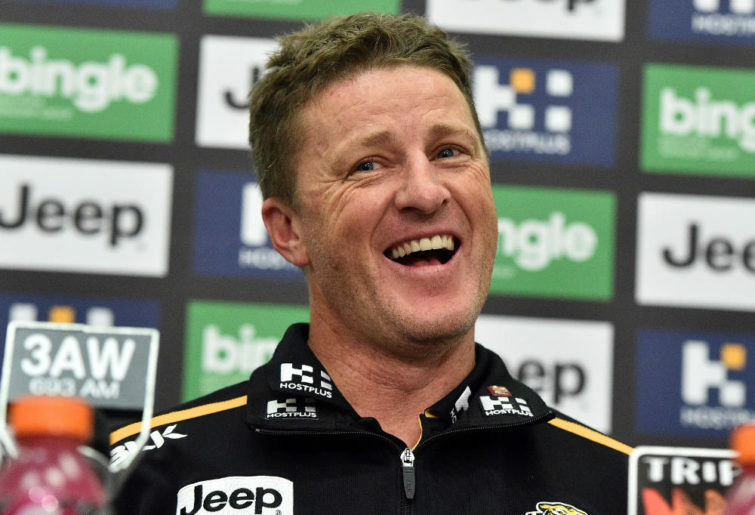 It was a win for the belief of a proud club, and most supporters would suggest was the best home-and-away victory of Damien Hardwick’s coaching career. It was a pulsating match of high-intensity attack and counter-attack that thrilled Richmond fans and neutral supporters alike. Power followers can be excused for not appreciating it. Elsewhere, North Melbourne had their first win to stop the season slipping away. Admittedly it wasn’t pretty, but Adelaide are in poor form right now, and none of their games have been quality affairs this season. Some teams are like that for patches within a season. It can’t all be sugar and lollipops. Melbourne and Essendon have both been under the gun in the early parts of the year, but now have a foothold into the season. The Demons produced a strong performance on the road with their backs to the wall on Thursday night. The Bombers found the balance between attack and defence to win their second match in a row, playing some superb football in doing so. Anthony McDonald-Tipungwuti set the MCG alight. Gold Coast and St Kilda are both sitting in the top six with 3-1 records, inspiring their supporters and nurturing hope that the dark days could be over a lot quicker than imagined. There are some wonderful stories emerging this season. Yet the two most prominent AFL journalists in the country felt that possession football should be a negative talking point. This is one of the problems we have as an industry when a Friday night game doesn’t scale awesome heights. The short-term reactionism is mind-numbing. And it is fair to say Collingwood versus Western Bulldogs wasn’t either sides finest hour. And yes, there were a lot of uncontested possessions and marks. But guess what, teams have different styles. Richmond won the 2017 premiership off the back of unrelenting pressure, particularly in the forward half of the ground. They continued on to be one of the best teams of 2018. West Coast and Collingwood have dismantled the Tigers in the last 12 months by playing a game style that diffuses the pressure element. This has been done by aggressively winning the ball off the opposition in the back half of the ground and spreading themselves around to kick and mark to gain control before attacking. This is wonderful evolution, exactly what we want from our coaches and players. Team A does this. Team B does that to counter. A mix of styles and aesthetics. Some teams like a kicking game. Others prefer handball. Some want to make it a stoppage game. Others want it out in the open. Ruckmen are a key to some teams, minor players for others. There seems to be a sad obsession some in the media have with wanting football to always look exactly the same, based on some mythical past that doesn’t exist except in imagination. Are Robinson and Barrett bored with the sport? Are they simpletons that don’t appreciate the nuances of the game? Are they nothing more than shock-jocks who see themselves as bigger than the game, and are thus determined to change it? I’d like to think none of these things are true, but they don’t make it easy.